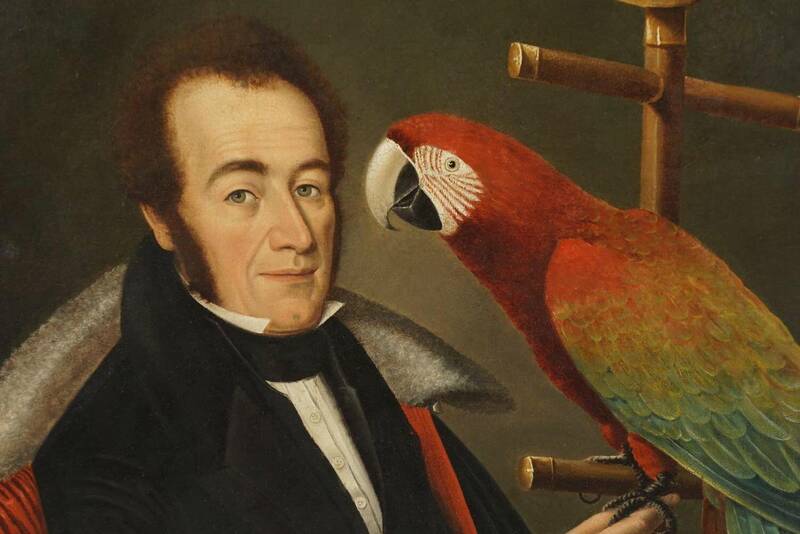 A rare and wonderful circa 1835 oil on canvas painting of a Chilean aristocrat with parrot firmly attributed to Italian painter Camilo Domeniconi, having red and white fur cape seated in a neoclassical armchair having lion-head armrest terminal with his obviously treasured pet, a large scarlet macaw parrot, balanced between right hand and wood and brass perch. 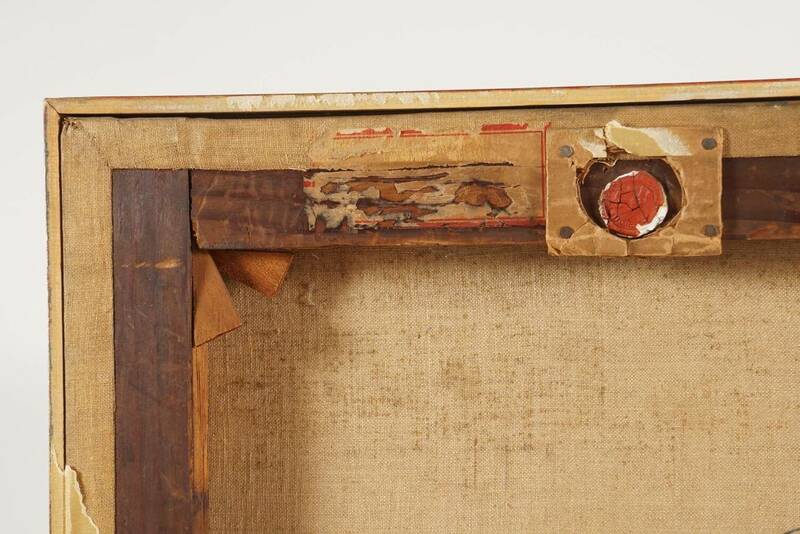 Minimal 20th century giltwood frame with former collection tag at lower right. 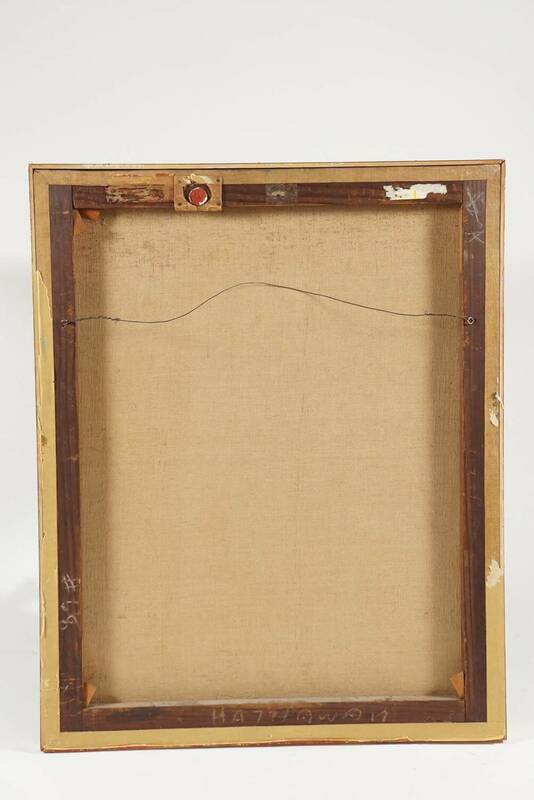 Canvas measures 25.6" wide by 32.13". Reverse having a partially decipherable original red wax seal with 'Trieste' visible. 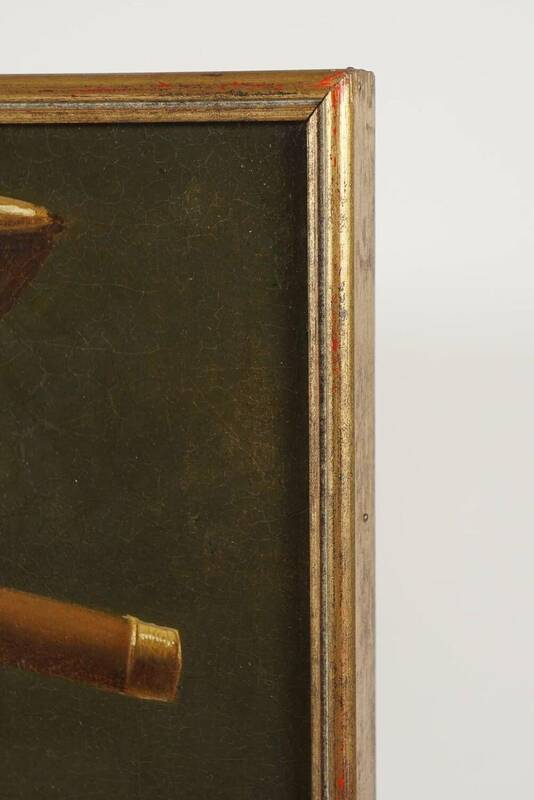 A truly exceptional and visually dynamic work from an incredibly rare and important painter working in early 19th century South America. Biography: Camilo Domeniconi (born Italy c. 1800 - died Rome 1860) Born in Italy and studied art in Rome before moving to Santiago, Chile in 1830 and returning to Italy the summer of 1838. Considered a fashionable portraitist after his arrival, his private studio was in Ahumada and Compañía streets, where he lived with the architect and draftsman Pedro Dejean. In 1835, the Chilean government commissioned Domeniconi to paint Chilean statesman Diego Portales, and again in 1837 after Portales' assassination. He served as Chilean Ambassador to Rome from 1851 until his death in 1860. According to Chilean writer and critic Blanco Cuartin, "This portraitist [Domeniconi] was not a painter, only a young man of letters, passionate and beautiful like all Italians". While obviously Domeniconi was talented, Cuartin's commentary on him likely stems from the sophisticated naïveté so evidently exhibited in this portrait as well as the portrait of Portales in the permanent collection of the Chilean National Museum of Fine Arts (Museo Nacional de Bellas Artes). Literature: Gesualdo, Vicente. Encyclopedia of Art in America. Biographies Volume I. Buenos Aires, Argentina: Bibliographic Editorial OMEBA, 1969. Rodrigues Villegas, Hernán. Artists in Chile in the first half of the 19th century: Contribution to the History of American Art. Offprint of the Chilean Academy of History Bulletin. No. 100, Santiago, 1989. Rojas Abrigo, Alice. History of Chilean painting. Santiago: Impresiones Vicuña, 1981. Ruiz de Viñaspre Puig. Paintings with History. Santiago: National Historical Museum, 1993. Pereira Salas, Eugenio. Studies on the History of Art in Republican Chile. (Edition by Regina Claro Tocornal), Santiago, Editions of the University of Chile (Santiago, University), 1992, pp. 38-39. 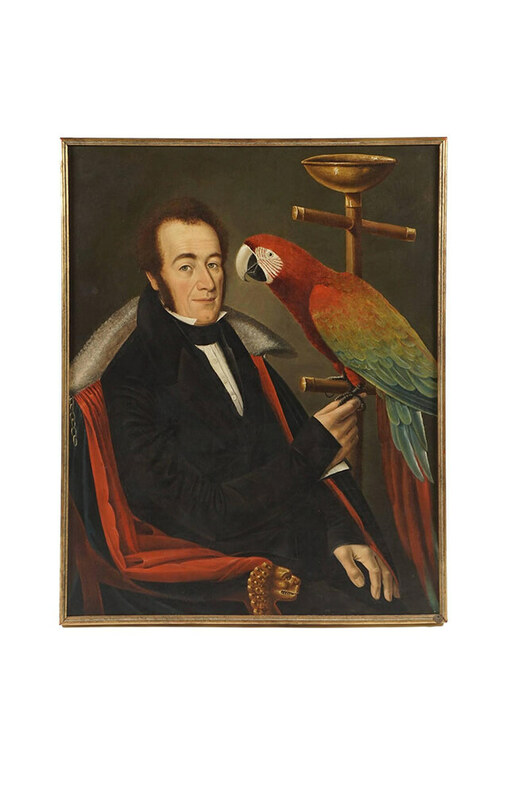 A rare and wonderful circa 1835 oil on canvas painting of a Chilean aristocrat with parrot firmly attributed to Italian painter Camilo Domeniconi, having red and white fur cape seated in a neoclassical armchair having lion-head armrest terminal with his obviously treasured pet, a large scarlet macaw parrot, balanced between right hand and wood and brass perch. Minimal 20th century giltwood frame with former collection tag at lower right. Canvas measures 25.6″ wide by 32.13″. 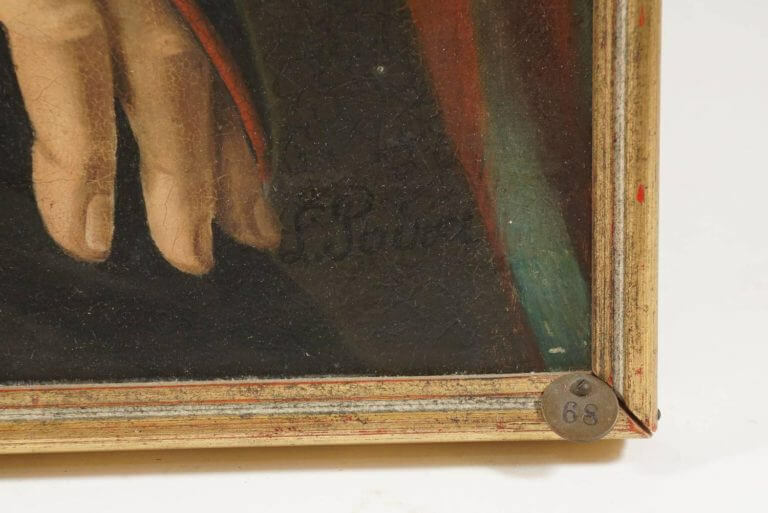 Reverse having a partially decipherable original red wax seal with ‘Trieste’ visible. A truly exceptional and visually dynamic work from an incredibly rare and important painter working in early 19th century South America. Born in Italy and studied art in Rome before moving to Santiago, Chile in 1830 and returning to Italy the summer of 1838. Considered a fashionable portraitist after his arrival, his private studio was in Ahumada and Compañía streets, where he lived with the architect and draftsman Pedro Dejean. In 1835, the Chilean government commissioned Domeniconi to paint Chilean statesman Diego Portales, and again in 1837 after Portales’ assassination. He served as Chilean Ambassador to Rome from 1851 until his death in 1860. 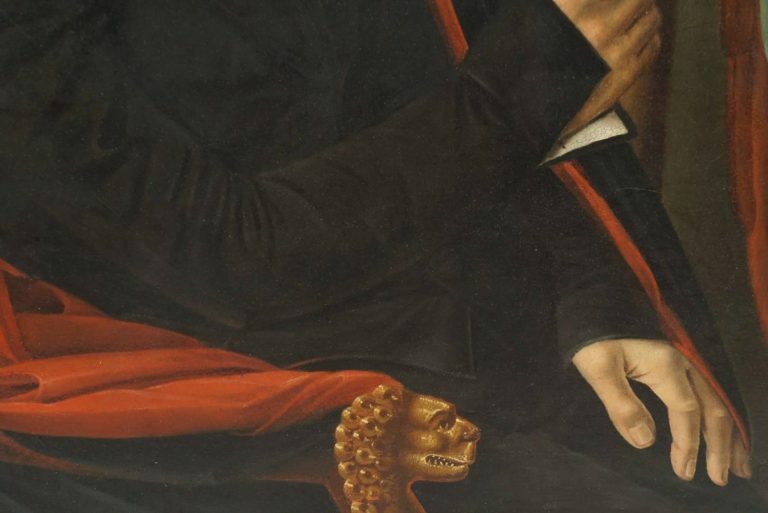 According to Chilean writer and critic Blanco Cuartin, “This portraitist [Domeniconi] was not a painter, only a young man of letters, passionate and beautiful like all Italians”. While obviously Domeniconi was talented, Cuartin’s commentary on him likely stems from the sophisticated naïveté so evidently exhibited in this portrait as well as the portrait of Portales in the permanent collection of the Chilean National Museum of Fine Arts (Museo Nacional de Bellas Artes). Gesualdo, Vicente. Encyclopedia of Art in America. Biographies Volume I. Buenos Aires, Argentina: Bibliographic Editorial OMEBA, 1969. Rodrigues Villegas, Hernán. Artists in Chile in the first half of the 19th century: Contribution to the History of American Art. Offprint of the Chilean Academy of History Bulletin. No. 100, Santiago, 1989. Rojas Abrigo, Alice. History of Chilean painting. Santiago: Impresiones Vicuña, 1981. Ruiz de Viñaspre Puig. Paintings with History. Santiago: National Historical Museum, 1993. Pereira Salas, Eugenio. Studies on the History of Art in Republican Chile. (Edition by Regina Claro Tocornal), Santiago, Editions of the University of Chile (Santiago, University), 1992, pp. 38-39.